If you liked the jacket I wore earlier this week, today I will show you how to do it. 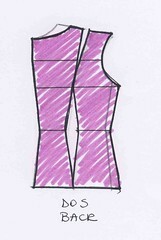 You know the rule number 1: the starting point is your made-to-measure bodice shell. Join the waist dart with the shoulder dart by rounding angles. You get two pattern pieces for the front and two for the back. Mark notches on the shoulder line, underarm and waistline. For this jacket, I added 3 cm of ease on the side and I lowered down the underarm line with 1.5 cm. I also enlarged the neckline with 2 cm. 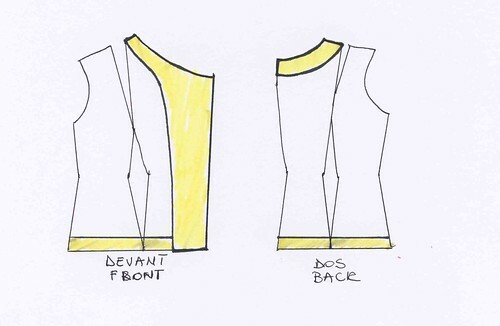 These changes must be applied to both front and back pattern. From the center front line, go 3 cm to the right and draw a slanting line. The angle and height of this line will determine the style of your collar. The more slanting is the line, the larger is the collar, the higher is the line, the more covered will be your neck when closing the jacket. 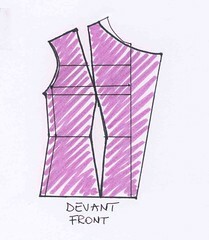 Redraw the neckline between the slanting line and the shoulder line. The sleeves are made with the basic sleeve pattern. I did not make a hem, but I created facings to the collar, cuffs and bottom hem. I attached the facings to the jacket with a zigzag stitch, leaving the raw edges visible. 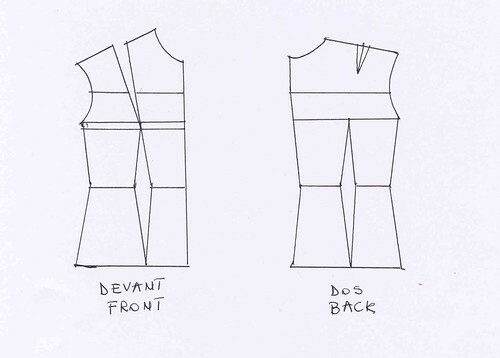 Here’s your Perfecto jacket pattern on your measures. You can start looking for a nice heavy fabric and a beautiful zipper. This entry was posted in Patterns and tagged jacket, pattern alteration. Hi! I just wanted to let you know that I think your work is very inspirational and I’m following you on bloglovin’. I can’t wait to see more posts.